The Bander-in-charge (BIC) is the individual who on a given day is responsible for supervising banding and all other activities at MBO. Some BICs stay for weeks, others for years; sometimes there are several sharing the schedule, and other times it is one BIC who runs the program day after day. This page provides a brief introduction to current and past BICs at MBO. 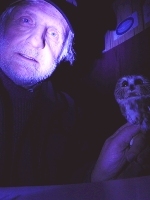 Marcel entered the world of banding through Saw-whet Owls at Innis Point Bird Observatory in Ottawa in 2000, and was delighted when Marie-Anne and Shawn provided the additional interest and effort needed to get MBO started in 2004. Marcel was the lone BIC for most of MBO's first two years, but was able to take some time off once Marie-Anne and Barbara had their permits. He is now only a part-time BIC, but remains active behind the scenes as Executive Director of MRF, and maintains the website, including the MBO photo ID gallery. 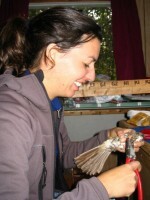 Marie-Anne has been bird-banding since Marcel introduced her to Saw-whet Owls in the fall of 2002. The owls brought her in, but the passerines made her stay. Marie-Anne is one of the founders of MBO, and is mighty proud of it. 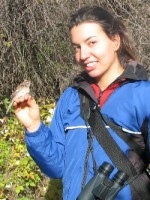 When not banding, she worked on her PhD thesis at McGill University, examining the reproductive success of birds breeding on golf courses and other urban green spaces. 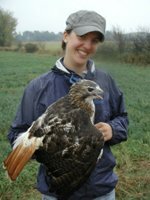 She is now working as Environment Canada's Bird Surveys Biologist, but remains involved with MBO both on-site and behind the scenes. 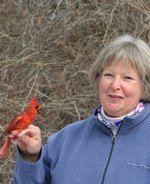 Like Marcel, Barbara's first banding experiences were at Innis Point Bird Observatory in Ottawa - though in her case it involved mist nets filled with flocks of Yellow-rumped Warblers. Impressed by her natural abilities as an extractor, Marcel was happy to be able to lure her to MBO, where additional apprenticeship enabled Barbara to obtain her own permit. 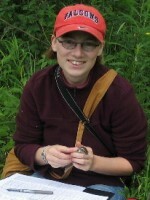 Outside of MBO, Barbara can often be found in woodlots in southern Ontario, studying Red-headed Woodpeckers for her PhD thesis at McGill University. Gay has been one of the core volunteers at MBO right from the beginning. Over the years she has not only studied hard to become an independent bander, but has also put in countless hours helping with all the other aspects of MBO's operation, from fundraising and education to site maintenance. 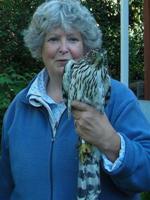 With great experience as both a teacher and a birder, Gay is a great addition to the team of BICs at MBO. 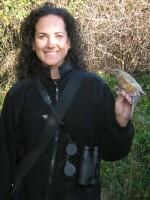 In addition to spelling off the other BICs during migration, Gay is overseeing the winter and summer monitoring programs, and is the current MBO Director. Simon came to MBO as an intern for the 2008 spring season, cementing his place in the MBO history books as MBO's first long-term intern. 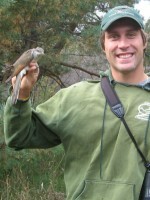 He was introduced to bird banding while working with shorebirds in an ornithology class in Cegep. He has since gained additional experience and acquired his own banding subpermit, and by 2010 was the primary BIC at MBO. Bob has been interested in birds since he was a nipper in England. After completing a formal education as a physical metallurgist, he moved to Canada and McGill University, where he completed graduate studies and worked in the Engineering faculty. He was an avid bird lister before seeing the light and switching his attention to migration studies on gulls, shorebirds, and hawks. His baptism in bird banding came as a member of a small team that for several years caught and banded Saw-whet Owls roosting in the Cote Vertu area of Montreal. 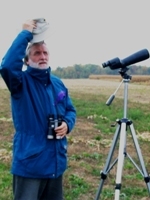 Bob began volunteering with the MBO saw-whet project during its early days, and took over as the lead owl bander in fall 2011, while continuing to conduct the annual Montreal hawkwatch. 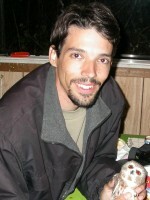 A self-confessed night owl, he helped the team catch and band a record 199 saw-whets in fall 2011. 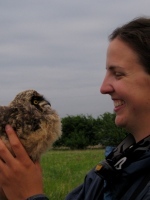 Kristen came to McGill University to pursue a Master's project studying nomadism and habitat use of Short-eared Owls. It wasn't long though before the smaller Northern Saw-whet Owls also captured her attention - by the fall of 2009 she was aboard the team as one of MBO's owl banders, and in 2010 she took over coordination of the program, which was expanded for the first time to a full six-week monitoring period. 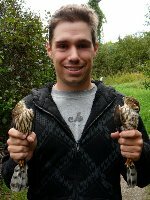 Shawn's background is in waterfowl research, but like Marie-Anne, he became involved in establishing MBO as a result of quality time spent with Saw-whet Owls during a visit to Ottawa. 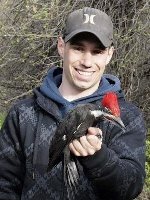 Shawn's field work in New Brunswick on Red-breasted Mergansers for his PhD thesis has often kept him away from MBO during the peaks of migration, but he has been heavily involved in both the owl monitoring program and winter banding. 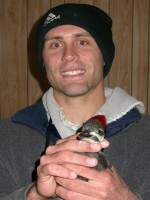 Seabrooke came to MBO from Toronto to be BIC for the first half of the Fall 2006 migration season. She has previously worked at Tommy Thompson Park Bird Research Station in Toronto, Vaseux Lake Bird Observatory in British Columbia, and Pelee Island Bird Observatory in southwestern Ontario - and is looking forward to setting up a new migration monitoring station of her own in Ontario. 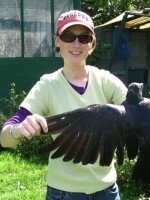 During her stay at MBO, we managed to find her an opportunity to band a species we don't usually handle - American Crows! James was the primary BIC for the busy fall 2008 migration monitoring season - he claims to be a lucky bander, and the number of records broken during his two-month stay attest to that! 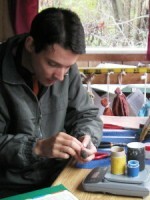 Originally from Colorado, James has worked on banding projects across North America and beyond, including Jamaica. Having previously trained MAPS interns for the Institute for Bird Populations, James was well prepared for introducing the new crop of fall students to the world of banding at MBO.